Hello everyone! Sorry for not posting for such a long time! I've missed blogging so I thought i'd try to quickly write a a post. I'l try my best to keep regularly posting now but I tend to get quite busy at the moment! Anyway, I'm back with a second part to 'Starting a New Art Project'-it's not really new anymore but I'll stick with the title he-he! 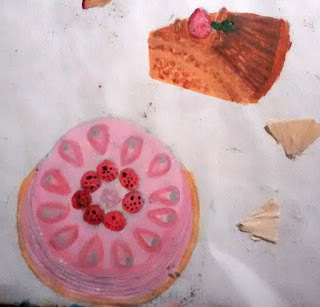 So, in this post I'll be showing you a few of my drawings that I've done in my 'Personal Collection-stationery and craft supplies' project so far. At this point in my project, I've now done a double page spread of observational drawings based on the photos I showed you last week. It took me a long time but I love looking back at my project at this stage to see the progress I've made! 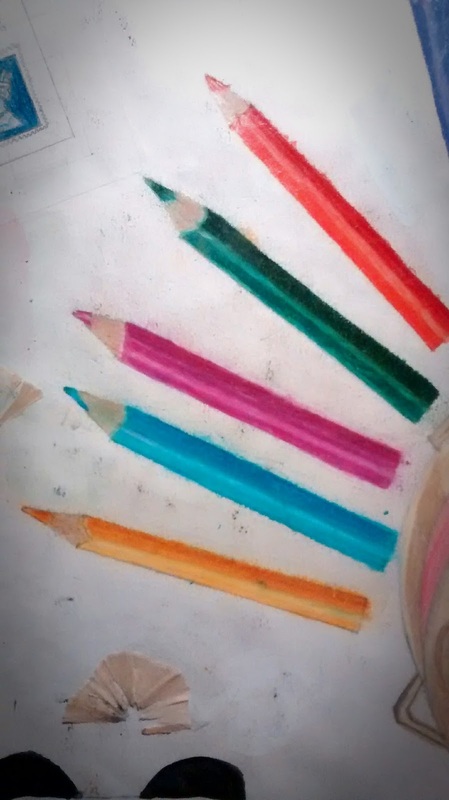 This first drawing is of some mini pencils that I createdwith my Prismacolor pencils. I wish that I'd just left a gap on the paper for the white stripe since it took a long time to create a white light strip after I'd coloured it in already! Oh well- I'm quite happy with this drawing since I like that the light as added a realistic look to the drawing rather than just cartoon-y. These next drawings are quite small so I found it quite difficult to add details. I used acrylic paint which I find quite hard to control sometimes (since I haven' had much experience with it). However, I don'y think these turned out as badly as I had expected them to. They're quite cute ad I like the texture on these. This is one of my favourite drawings on the double page spread so that's why I decided to give it its own photo (I haven't zoomed in all of the drawings). I created this with black fineliner and it was a lot of fun to give ink another go! I haven't used ink since Inktober really (last October) so I was glad to see that I remembered how to control the pen! 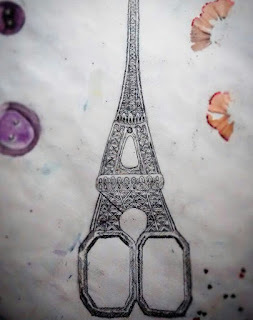 In real life, these eiffel tower scissors are a rose gold colour but I made it simpler for myself by keeping it black and white for this drawing. The lineart itself was very detailed so it took a long time but I love the overall effect! 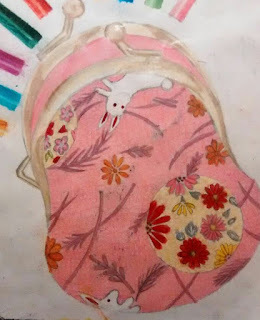 These next photos are both the same drawing of a purse that I keep my mini pencils in, the purse was a gift from Japan. This is my favourite drawing (with the eiffel tower scissors being in a close second) and it's a good job that I love it since it took me hours! Actually, I wasn't really counting in hours, I was counting in TV programmes and films that I watched in the background whilst drawing it! But when I calculated the length of the programmes together, it seems that I took about 3 and a half hours on this! Oops! You can see that I created the texture of fabric on the purse in the photo on the right. Here's the completed double page spread, the lighting in the photo is a little iffy but hopefully you can see all the drawings clearly! 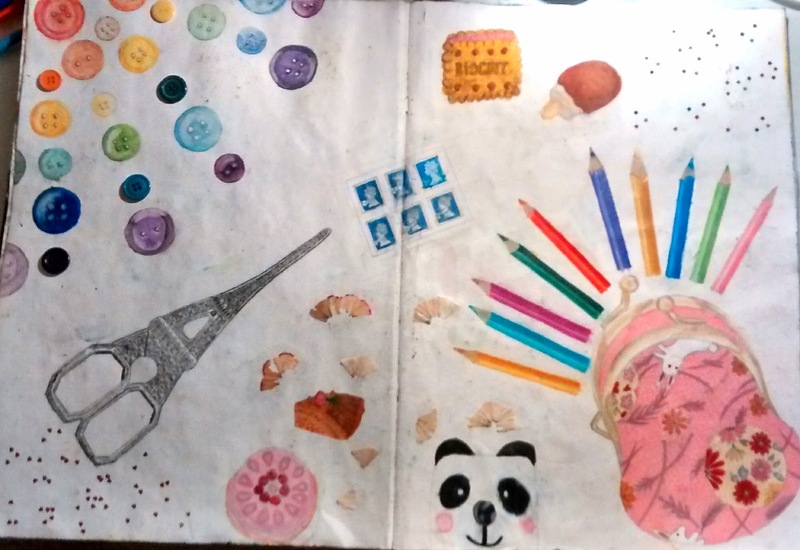 I wanted to create an interesting layout and add collage-like features such as sequins, stamps, buttons and pencil sharpenings. There are a few drawings that I'm not keen on such as the stamps and the panda sharpener but overall I'm proud of the results of this page. That's all for this post! I hope you've enjoyed nosey-ing at my sketchbook, like I said in my last post I like to do that too! I think I'll only do one more of these 'Starting a New Art Project' since I don't want to be stuck in one blog series-I want to try new topics like bullet journalling and calligraphy and just experiment really this year. What do you think of my observational drawings? Have you been doing an art project recently either at school or at home? Let me know in the comments! The purse sketch is also definitely one of my favourite things from your project on the whole and I remember you sharing this one on Instagram too! I may have mentioned this already, but I adore the vibrant pink in this one! It's easy to tell that it would have taken such a long time and so much effort with those gorgeous patterns! :D Another thing I wanted to say here is that I love how you drew on the background details as well since I'm always personally so lazy with background patterns in art and just assume something! xD So beautiful! Oh wow, the overall result is amazing! It's so colourful and eye-catchy and I really like the buttons in the corner! On the contrary, I think the panda sharpener sketch looks so adorable down there! C: How did you come up with the layout of the double page spread? Did you have to plan it out beforehand or did you make it up as you went along? Hello Kenza! Yes it's great to see you again! I hope your holiday has been lovely-where did you go and how was it? Thank you so much! 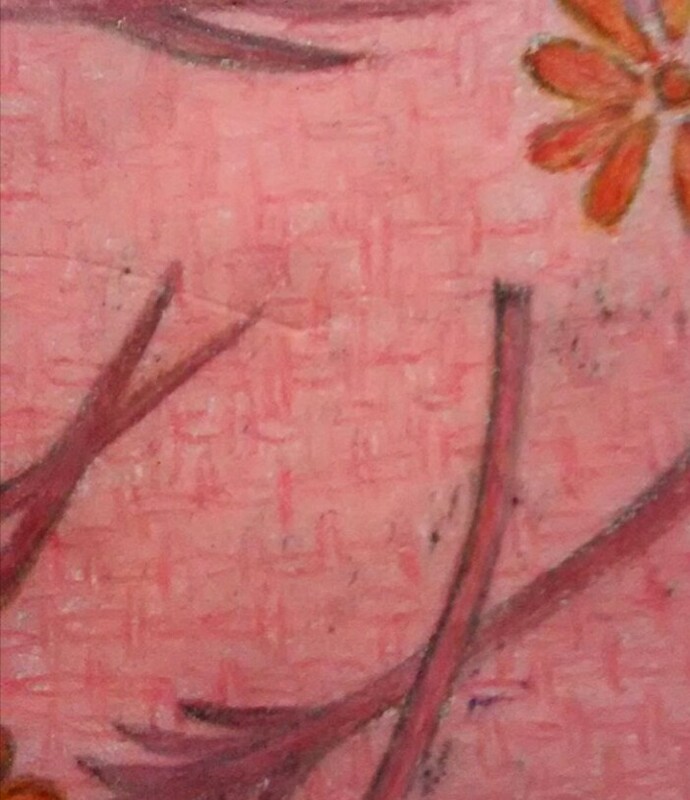 Yes, it was difficult to add over the top-but at least I still had a white prismacolour pencil, now it's stubby and so I have to use an ordinary one. But I've got so used to prismacolours that it's so hard to use another brand-I hope I don't ever lose my Prismacolours! Yes they were erasers-I love collecting erasers in particular since there's so many different designs! Thank you! Drawing the eiffel tower scissors has been my favourite thing to do in my project-I think I've drawn them at least 3 times in this project! Yes I find using a fineliner much easier now. Thank you so so much for recommending that I should do Inktober last year-it's been the best thing I've ever done! I've seen so much improvement since tehn and it was the practice I needed before starting the GCSE Art course! I know what you mean about the assuming things in artwork, I'm always doing that! If I can't quite make out the detail that I need to make something look realistic, I'll just make it up! That's really bad I know! But if it's in a personal sketchbook that's fine but at school they always seem to want photorealism. Thank you so much Kenza! I'm so glad that you like it! I'm not entirely sure how I came up with it really. I think I had a few ideas in my head anyway (I knew I wanted the buttons in one corner and the purse in the opposite corner) and then I just filled in the spaces inbetween with everything I had photographed up until that point! I think I just pencilled it all in first and then made one or two tweaks, but nothing much.